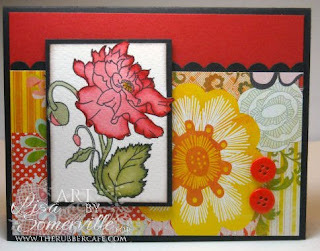 Here I've combined Basic Grey June Bug paper with this beautiful Poppy from The Rubber Cafe. I used the Marker Watercoloring Technique to color the image, then used the Out of the Box Technique to pop parts of the Poppy outside my panel. The edges are sponged with Soft Suede. The Scallop edge under the June Bug paper is created with the Scallop Edge Punch.